Editorial: 'Smile' is everywhere - where is the occlusion? Especially before orthodontic or dental restorative treatment, patients should be screened for temporomandibular dysfunction. A short clinical screening battery of six tests requiring a simple 'Yes' or 'No' response was developed based on Krogh and Poulsen's method for initial functional diagnosis of the masticatory system. Ahlers and Jakstat confirmed the scientific reliability of the new screening instrument. Establishing the presence or absence of physiological centric relation is an important element of this test, and is the basis of further restorative and orthodontic treatment decision making. This case report describes a successful two-stage orthodontic treatment combined with a previous restorative treatment. A 45-year-old man, with attrition on the cervical-buccal and occlusal surface of the teeth with the consequent decrease of the vertical dimension, due to severe bruxism. Phase one consisted of an increase of the vertical dimension following the principles of the bioesthetic with a restorative treatment, before a second phase of orthodontic treatment with a clear removable appliance (Invisalign). The total treatment period was 18 months, and the final result was the patient's facial muscle pain and parafunctional movement disappearing. Correcting severe deep bite in adults is a challenging task - and much more so with removable aligners. This article reports on six patients with severe deep bite, who were all successfully treated with the Invisalign system and the same treatment protocol paying special attention to the important position of the lower canines. Aligners alone are incapable of successfully correcting a deep Curve of Spee - only with auxiliary tools, such as special designed attachments, and the conscious use of overcorrection and staging a correction of a severe deep bite can this be successfully achieved. Objective: To describe the use of clear aligners to achieve mandibular advancement in patients with retrognathic mandible. Materials and methods: Four patients, aged 9 and 10 years old, with a molar Angle class II relationship and canine class II relationships and with convex profile with retruded mandible are presented and discussed. The patients were in correspondence of the pubertal peak, so treatment plans included the advancement of the mandible to possibly stimulate mandibular growth. Due to the aesthetic concerns of the patients and their parents, it was decided to correct the malocclusion by only using clear aligners, without additional appliances. Results: The important correction of canine and molar relationships was achieved within 6 to 8 months of treatment. The perception of facial profile improvement was motivating for patients and helped to reinforce treatment compliance. Conclusions: The presentation of these case reports shows that the use of clear aligners in growing patients to correct canine and molar class II relationships with retruded mandibles is successful. Objective: The purpose of this study was to evaluate the efficacy of AcceleDent and Orthopulse in accelerating the orthodontic tooth movement of aligner treatment. 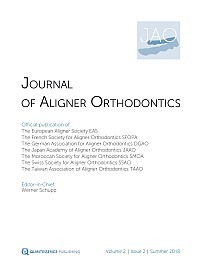 Materials and methods: In total, 30 patients without skeletal malocclusion were randomly assigned to three groups: the 7 days group - patients were instructed to change aligners every 7 days, without any accelerating devices; the AcceleDent group - patients were instructed to change aligners every 6 days, with the AcceleDent accelerating device; and the Orthopulse group - patients were instructed to change aligners every 5 days, with the Orthopulse accelerating device. Dental information was collected upon pretreatment, aligner 10 and aligner 20 by iTero scanner as T0, T1 and T2; treatment expected dental information was collected upon aligner 10 and aligner 20 by Clincheck as T1' and T2'. Data was imported and analysed by Geomagic qualify 2013, according to the peer assessment rating (PAR) method. Results: No statistical difference was found among those groups in both the maxillary and mandibular arches. The Orthopulse group had the highest tooth moving efficiency among the three groups for its shortest wearing duration and the least difference was between iTero scanner information and Clincheck Software Information, although the difference is not statistically significant. Conclusion: AcceleDent and Orthopulse accelerating devices did not show an observable effect with statistical significance.